A battle in the autumn of 1780 altered the course of American history. Thomas Jefferson deemed the battle “the turn of the tide of success” in the Revolutionary War. At Kings Mountain National Military Park, you can ponder the battle of Kings Mountain, where 900 Patriot militiamen met and defeated a force of 1,000 Loyalist militia and 120 Royal Provincials in a conflict that pitted Americans against each other. This Patriot victory on October 7, 1780 boosted morale in the South and eventually led to Lord Cornwallis' surrender at Yorktown a year later. Start your battlefield experience at the visitor center auditorium, where a brief History Channel orientation film introduces you to the men and women who met and clashed on top of Kings Mountain. After this general overview of the battle and its participants, make your way into the state-of-the-art museum, also in the visitor center. A life-sized old-growth forest that existed at the time of the battle greets you. 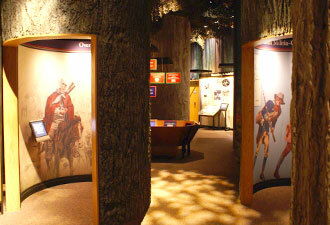 Each tree invites you inside to learn more about the pivotal Southern Campaign of the Revolution, the difficult choice of being Patriot or Loyalist in the Carolinas, the impact of the Patriot victory at Kings Mountain, and the efforts to commemorate and preserve the battlefield. You'll see weapons used in the battle, artifacts recovered from the battlefield, and an interactive topographical map of the ridge. Beyond the visitor center, a 1.5-mile paved Battlefield Trail allows you to “walk in the shoes” of those Patriots and Loyalists who fought here. You begin your journey looking through the eyes of Patriots as you round the base of the hill and wind your way towards the summit. As you crest the 1,020-foot ridge, your view changes to that of Loyalists defending this peak. You follow their panicked route to the far end of the ridge, where surrender and defeat awaits. Several monuments and markers dot your path, including the Chronicle Marker, the second-oldest war memorial in the country; the Centennial Monument, which guards the highest point on the ridge; and the U.S. Monument, which marks the area of Loyalist surrender. Interpretive wayside signs along the trail explain different aspects of the battle, and a new cell phone audio tour gives soldiers' first-hand accounts of the conflict. 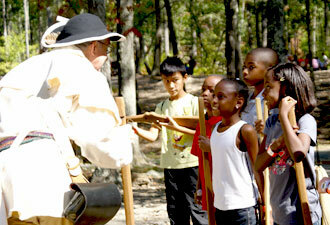 Kings Mountain hosts a variety of special events from March through November. When you visit, you might see Patriot, Loyalist, and British living history interpreters demonstrating colonial trades and crafts, military camp life, and the weapons used during the American Revolution. Bring your kids to Junior Ranger Day, where they can get hands-on experience in the jobs that park rangers do—telling stories with park artifacts, putting out wildland fires, and protecting the park and its visitors. Kids also enjoy Colonial Children's Day as they don colonial clothes, learn the musket drill with wooden guns, make their own cornhusk doll, and more. Experience the battlefield as it would have looked the night after the battle on guided lantern tours on Kings Mountain's anniversary weekend. Located just 45 minutes south of Charlotte, North Carolina, and 30 minutes north of Spartanburg, South Carolina, the park is easily accessible via Interstate 85 (Exit 2 in North Carolina) and Highway 161. 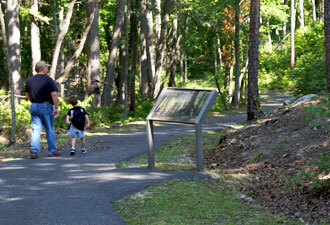 You can spend the whole day exploring Kings Mountain, or plan a shorter morning or afternoon visit. For directions and more information, visit our website. We look forward to seeing you.